Happy Blogiversary To Me and a Giveaway for You! 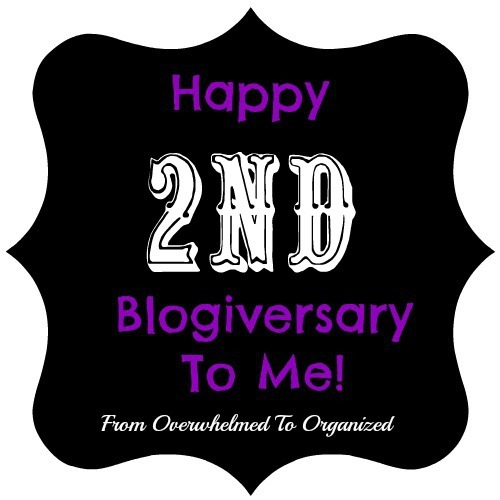 | From Overwhelmed to Organized: Happy Blogiversary To Me and a Giveaway for You! I've been encouraged, inspired, and amazed by the members of the 365 in 365 Facebook group, who share their decluttering efforts every day. To celebrate my 2 year blogiversary, I want to look back this week on the past year's most popular posts. These may be new to some of you or a fun flashback for others. And to thank you for your support all year, I'm giving away 2 great organizing ebooks and a $25 gift card to Target (good for US or Canada). Make sure you enter in the Rafflecopter form at the end of this post! 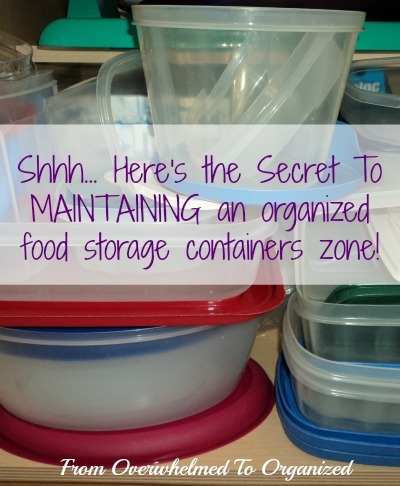 One of the most popular posts this year was The Secret for Organizing Food Storage Containers. This was part of my kitchen organizing tips series, which lasted half the year. I love how organized my kitchen is now, and it was so much fun sharing tips to help you organize yours. Can't wait to see what this year brings - love reading you blog. Happy 2nd Blogiversary! I have enjoyed reading each and every post, and I can't wait to see what new things you have to share. Thanks for being such an inspiration Hilda! And here's to many, many, many more years of wonderful organizing goodness! Oh, and my favorite posts are all of them.... but if I can only choose one, I pick the Organizing for the Weekend ones! Congratulations on your Second Blogiversary Hilda! I liked your ideas for organising recipes, and dealing with all the paper around our homes. One that I'll be taking a look at today is the featured post on the Dreaded Plastics Drawer. Your tips are simple and effective. I love your kitchen organizing posts. That's where I need the most help! I love the series on getting organized for traveling! I like the School File Bins post, especially now with school over! I like the 31 Days of Easy Decluttering posts. It is less overwhelming for me to get organized when I can work on a bunch of little projects for 10-15 minutes every day. I like your pretty paint jars! 31 days of easy decluttering makes it so much more manageable!